Loch Ness is famous all over the world for its beauty and its mystery and it would be hard to discover an equal to this area as a centre for exploring all that the Highlands have to offer. South Loch Ness is proud of it's reputation as the quiet side - protected from, but within easy reach of, the tourist attractions across the water. 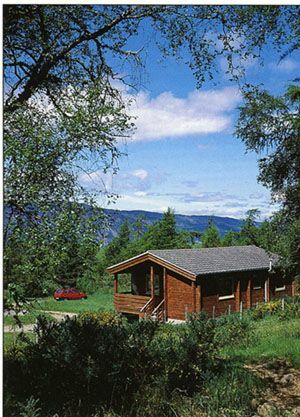 Our three modern, well equipped self catering cabins are situated in a secluded location on a farm high above Loch Ness. They lie in a wooded area and the ground immediately above opens out onto a heathery moorland. The variety provides habitat, within 100 metres of your cabin, for roe and sika deer, fox, pheasant, grouse and a whole range of other wildlife. The surrounding countryside is ideally suited for bird watching and hill walking. As there are only three cabins on the site, the tranquility of the area is preserved. The village of Dores, 2 miles away, has only 100 inhabitants and lies on a picturesque bay. Despite the seclusion of this location, the centre of Inverness is only 15 minutes drive away. This town has been called the "Hub of the Highlands" and this is an apt description, because its facilities serve a vast area, and a radial road system can take you north to Sutherland, west to Skye, east to Aberdeen and south to Aviemore and the Cairngorm mountains, all within a comfortable day. The Self Catering Cabins are equipped with electric cooker, fridge-freezer, digital television, bath and shower. The main bedroom has a double bed and the other has two singles. If there are more than four occupants, two beds can be made up in the living room. Electricity in the Cabins is charged for by means of a £1 slot meter. (We always have coins if you need them.) Following the recent price rises we are now subsidising the cost of electricity by about 40%, so the expenditure is very reasonable.